Our God has proven himself selfless, to the point of accepting the required penalty for our sin at His own expense. Therefore, He responds to offense (once sincerely confessed) with grace, forgiveness, patience and redemption. Of course, we acknowledge these attributes of God all the time, but when it comes right down to it, we often believe in them as much as we do the Easter Bunny. They really seem too good to be true, more like a flannel-graph children’s story than real life. This is especially if you’ve never seen someone demonstrate patience under pressure or forgiveness after cruel exploitation. Regardless of difficulty, believing is pretty much the key. You must believe our God is more wonderful than you could imagine. 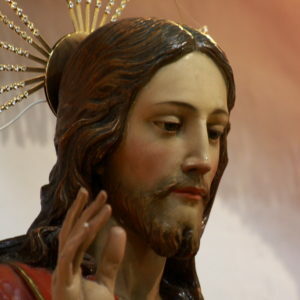 Forget about whatever choices you made in the past and think about this: If you had been the one who actually carried out Christ’s crucifixion and then stood back and mocked Him as His precious blood dripped from your filthy hands, He would pray for forgiveness on your behalf, before you even asked for it. Even if you didn’t want it. If you find it impossible to believe in a God like that, you need to question whether your god is the God of the Bible or one of your own making, no more real than Zeus with his signature lightning bolt. “As far as the East is from the West…” – for real?!? God removes our transgressions that far from us!?! Reflect on that! (I mean, SELAH.) Do you even think David fully comprehended what he was saying? How could he have known that if he had said, “As far as the North is from the South…” it simply wouldn’t have had the same impact? North and South, of course, meet at the poles, but East and West never meet – ever. Further, Jesus hadn’t even died yet (in the scope of time), yet David already knew by faith, his sin was covered, forgiven and forgotten, utterly and completely! God would have to expect that you were going to meet a certain standard. Then you’d have to fail to meet it. Of course we fail to meet God’s standards every day, but here’s the deal. He already knew about every single one of your failures before you did it. It was those very failures for which He died. No, we weren’t the actual humans who crucified Jesus, but we might as well have been. Our sin is just as unforgiveable, and His grace just as forgiving. (Did I just contradict myself?) What’s more: He knows every choice you’ll make in the future, so you can’t disappoint Him then either. Even better: He knows precisely how many failures it will take for you to learn each lesson He has to teach you. You also eliminate one huge cause of shame. Furthermore (and please let this soak in), since God is gracious and forgiving and since (due to His omnipotence) He can’t be surprised by anything (including our failures), then He really doesn’t need any time to “get over” whatever it was we did wrong. He already got over it on the cross. QUESTION: Do you believe in a God like this? Do you live like you believe it? Why?